A.H. GARDINER, « The Ancient Military Road between Egypt and Palestine », JEA 6, 1920, p. 99-116 3 citation(s).  Ce document est consultable à partir d’un site extérieur nécessitant un abonnement ou un achat : http://www.jstor.org/stable/3853611. p. 100 111-113 pl. XII. p. 100 110-112 pl. XII. A.H. GARDINER, « The Gods of Thebes as Guarantors of Personal Property », JEA 48, 1962, p. 57-69 1 citation(s). A.H. GARDINER, The Kadesh Inscriptions of Ramses II, Oxford, 1960 1 citation(s). A.H. GARDINER, « The Baptism of Pharaoh », JEA 36, 1950, p. 3-12 4 citation(s). S. LANGDON, A.H. GARDINER, « The Treaty of Alliance between Ḫattušili, King of the Hittites, and the Pharaoh Ramesses II of Egypt », JEA 6/3, 1920, p. 179-205 1 citation(s). 4 975 349 visites - 2 634 visite(s) aujourd’hui - 6 connecte(s).